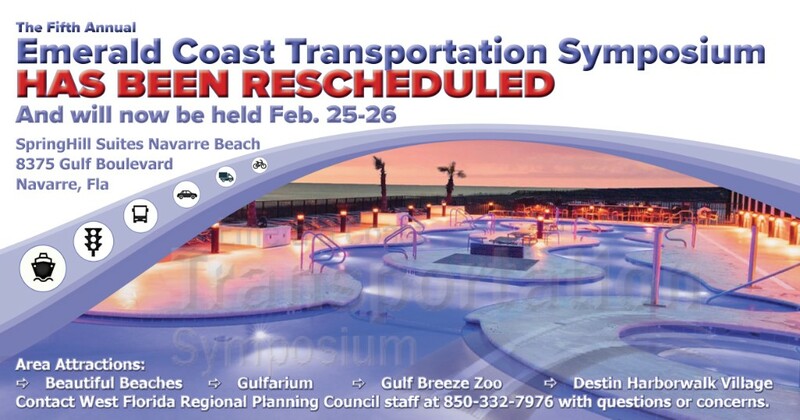 Thank you for understanding our decision to reschedule the Transportation Symposium, and be assured that we eagerly look forward to Feb. 25 – 26. We promise to deliver a symposium that, as always, will inspire our transportation professionals, but will also aid in the future planning and restoration that is now so desperately needed. Current registrations will automatically be applied to the February dates unless a refund is requested. Registration will remain open for those who wish to attend in February. Sponsorship opportunities are still available. All hotel reservations, made with the SpringHill Suites in Navarre, Fla. for the November dates have been canceled. The original room rates apply, but rooms must be booked under the new dates if you wish to stay onsite. Please book online or call 850-939-0010 and make the reservation under the block Emerald Coast Transportation Symposium. Please contact Brittany Ellers with questions regarding registration. The Transportation Alternatives (TA) Set-Aside provides funding for programs and projects consistent with Fixing America's Surface Transportation (FAST) Act under 23 U.S.C. 133(h). The TA set-aside funds, if awarded, can be used for all projects and activities defined as Transportation Alternatives such as: on- and off-road pedestrian and bicycle facilities, infrastructure projects for improving non-driver access to public transportation, community improvement activities, environmental mitigation and projects for planning, and designing or constructing boulevards and other roadways largely in the right-of-way of formerly divided highways. 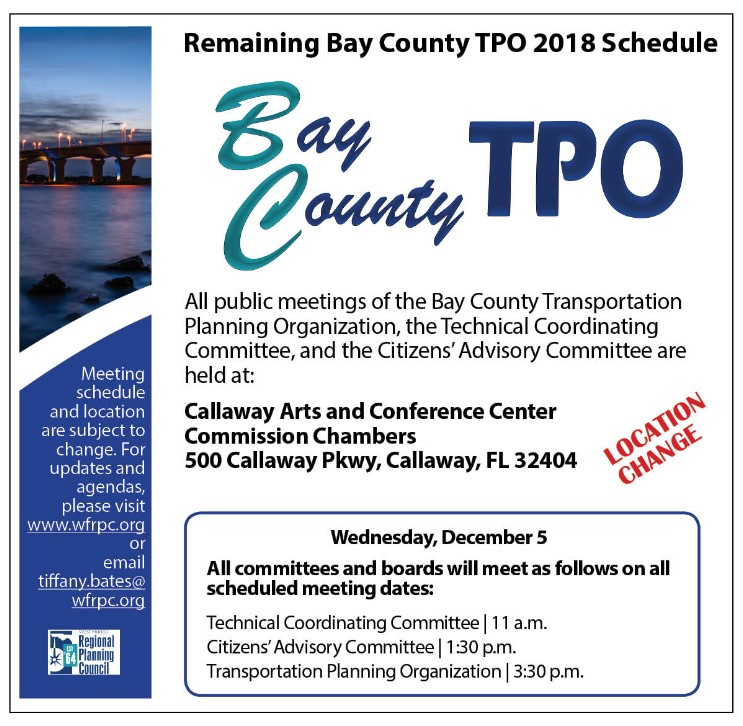 TPO staff will be submitting all applications from the Florida-Alabama, Okaloosa-Walton, and Bay County TPOs to FDOT. In order to meet FDOT’s January 2019 deadline, staff is requesting that all completed applications are received by the close of business on Friday, Dec. 28, 2018. There is no limit to the number of applications that may be submitted, but last year, FDOT considered the TPO’s top five priority projects. 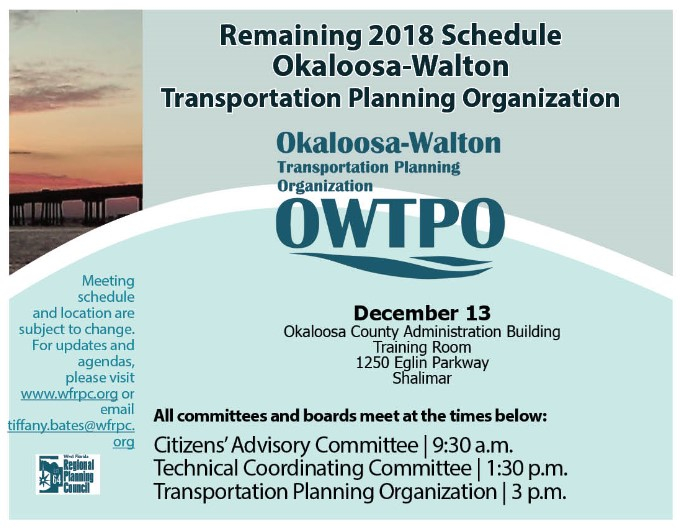 Additionally, TPO staff will be submitting Transportation Regional Incentives Program (TRIP) applications and is requesting that completed applications for TRIP also be received by close of business day Dec. 28, 2018. Please direct all questions and applications to Kristen Barre, at kristen.barre@wfrpc.org or (850) 332-7976, ext. 208. 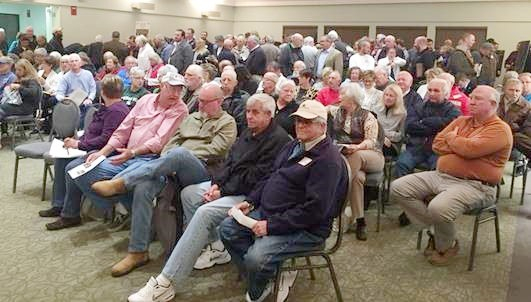 Above: Photos from the TA public meetings in the FL-AL and O-W study areas. 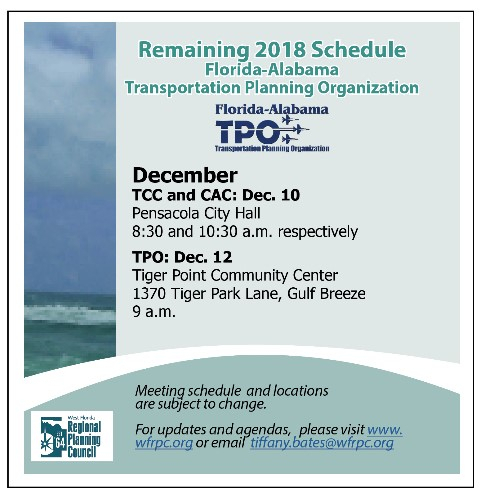 In 2017, the West Florida Regional Planning Council began an update to the Florida-Alabama Transportation Planning Organization’s Pedestrian/Bicycle Master Plan. 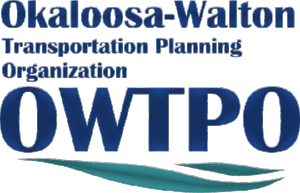 This plan examines the bicycle and pedestrian facilities in Escambia, Santa Rosa, and part of Baldwin counties by conducting a comprehensive evaluation of the existing network of pedestrian and bicycle facilities and connections to develop a shared vision for all communities in the FL-AL TPO area. The core of the plan includes the vision and objectives, a public participation summary, trends and issues in pedestrian/bicycle planning, a list of prioritized projects submitted by municipalities in the FL-AL TPO, and an explanation of the prioritization methodology. The plan will be presented to the Florida-Alabama TPO board for approval at the Dec. 13 meeting. Please email WFRPC staff member Kristen Barre or call 850-332-7976, ext. 208, if additional information is needed. 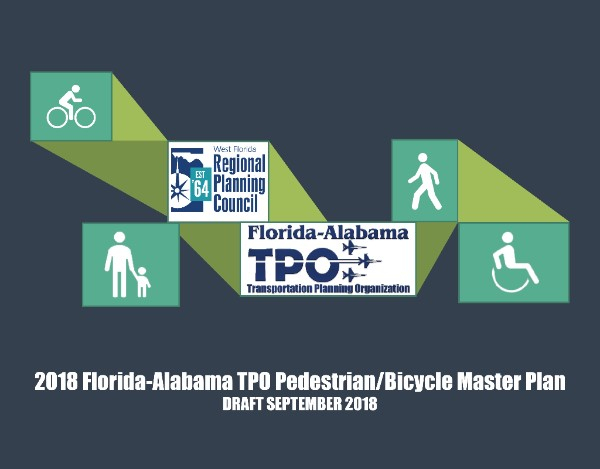 The draft Florida-Alabama TPO Pedestrian/Bicycle Master Plan may be viewed online. 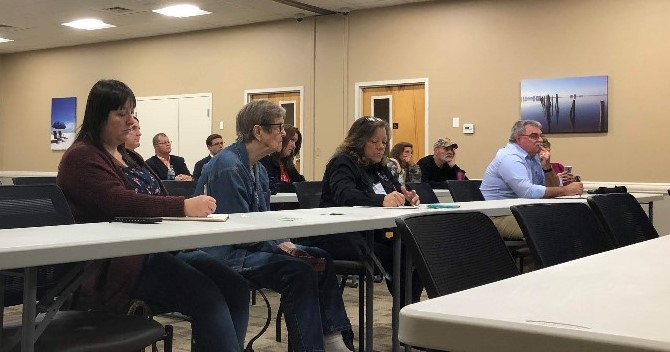 WFRPC staff hosted the Berryhill Road Corridor Management Plan Public Workshop on Nov. 13 in Milton, Fla., fostering conversation between city and county staff, elected officials, business and residential owners, and other county, municipal, and state department staff and stakeholders. Corridor management plans allow segments of the roadway studied to qualify for additional funding sources for improvements within the right-of-way. 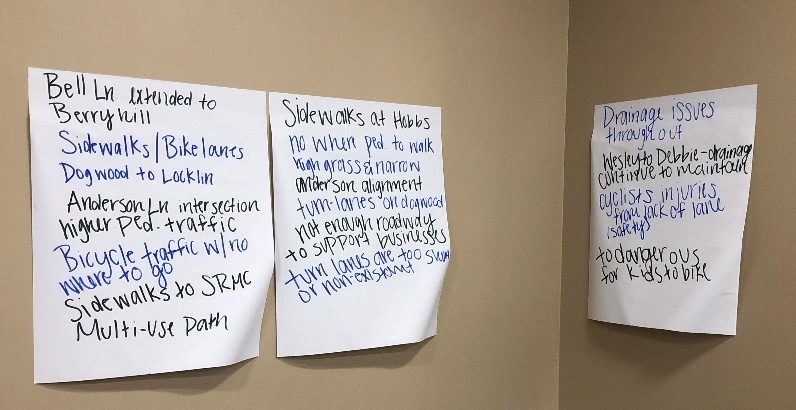 Attendees participated in interactive exercises to better understand the needs of the corridor and prioritize their desired outcomes for proposed improvements. Transportation Planner, Jill Lavender, presented the current state of the corridor as well as ideas for proposed improvements. Public Involvement Coordinator Annie Walthall led the participants through an exercise to prioritize needs along the corridor. 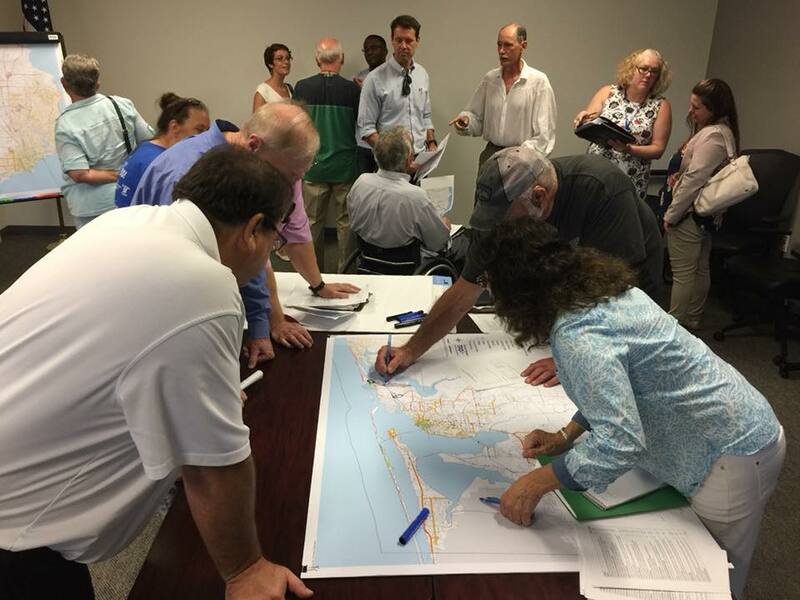 WFRPC Transportation Manager and Planners attended the Alabama Department of Transportation Public Hearing concerning the Connector from SR-180 to North of Intracoastal Waterway and Connector from North of the Intracoastal Waterway to Foley Beach Express projects in Orange Beach on Nov. 15. On behalf of the Bay Area Resource Council, WFRPC’s Partnership for Community Programs was awarded a $2,000 small grant from International Paper Foundation to support Bay Day 2019 in Escambia and Santa Rosa counties. Bay Day is an environmental education event that engages elementary age students in understanding the watershed and bay through interactive demonstrations. In 2018, Santa Rosa County Bay Day was held in May at the Russell Harbor Landing in Milton, while Escambia County Bay Day hosted students of the Play, Learn, Grow Summer Camp at Ebonwood Community Center in Pensacola in June. For information on the 2019 events, please contact the Pensacola and Perdido Bays Estuary Program or your county’s University of Florida, Institute of Food and Agricultural Sciences (UF/IFAS) Sea Grant agents: Escambia’s Rick O’Connor, and Santa Rosa’s Chris Verlinde. 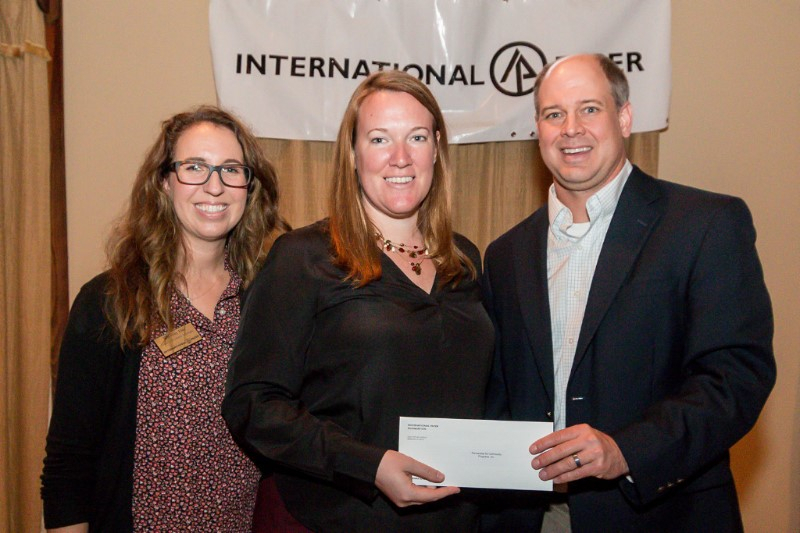 Above: International Paper Pensacola Mill Communications Manager, Whitney Fike (left), and International Paper Pensacola Mill Manager, Scott Taylor (right), present a $2,000 grant from International Paper Foundation for Bay Day 2019 to WFRPC Planner, Katie Wilhelm (center), representing Partnership for Community Programs and Bay Area Resource Council at the grantee luncheon in Pensacola on October 25. Environmental Protection Agency (EPA) is hosting a webinar for grant applicants on Tuesday, Dec. 11, from 1-3 p.m. (CST). 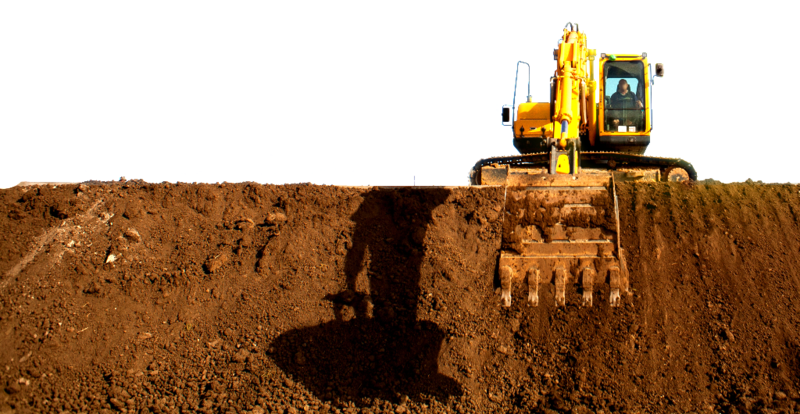 Those considering writing a Brownfields grant application for the fiscal year 2019 cycle are requested to attend the webinar. To be included on the list for updates for the webinar link and scheduling, please email Barbara Alfano at EPA. Additionally, WFRPC has loan funds available for eligible clean up projects as part of the WFRPC’s EPA Brownfields Clean Up Revolving Loan Fund through September 2019. For more information, view our webpage. If your municipality needs assistance with applications or managing Brownfields grants, please email WFRPC Grants Coordinator, Ada Clark, or call 850-332-7976. 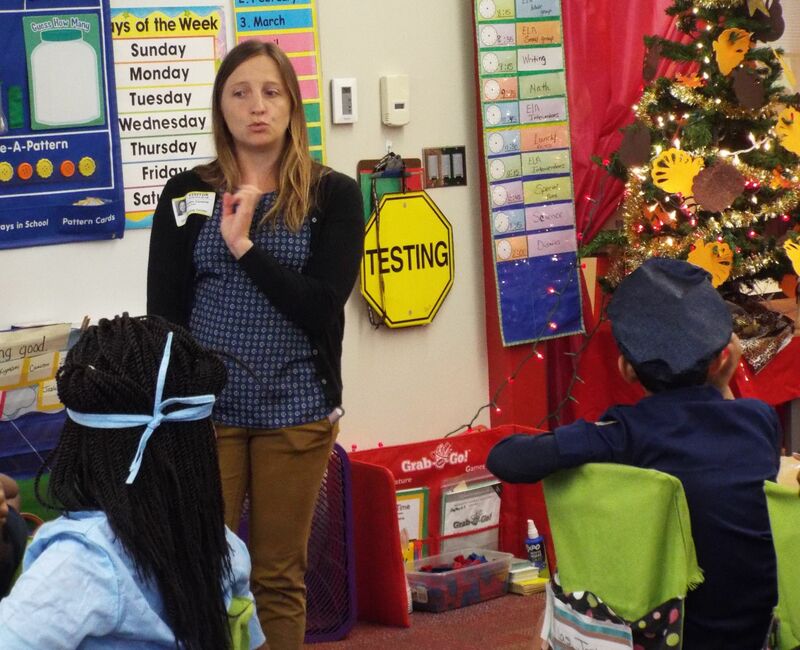 In celebration of Career Day on Oct. 26, Escambia County Area Transit (ECAT) presented to first graders at Global Learning Academy about the rewards and responsibilities of being a bus driver. WFRPC Planner and Safe Routes to School Educational Coordinator, Caitlin Cerame, provided bus riding tips for safely getting on and off a bus when traffic is nearby.